Properties in Hartford County average 4.7 out of 5 stars. Property 2: A European Country Getaway ~ 1930s Stone Cottage In Connecticut! Property 3: The Loft @ Lost Acres ~ A Peaceful Rural Escape on a Farm Winery! Large 3BD Ranch, Lots of Indoor and Outdoor Space, Fully Equipped. Property 8: Large 3BD Ranch, Lots of Indoor and Outdoor Space, Fully Equipped. 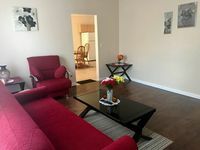 Property 23: Trendy+Cozy Home 10 Min Ride to Downtown Hartford! The Cliffview Farmhouse in the Heart of Horse Country! Property 24: The Cliffview Farmhouse in the Heart of Horse Country! Property 31: FARMINGTON | NEW BRITAIN BORDER'S LUX CORPORATE BUSINESS AND LEISURE HOME AWAY! Property 33: Lovely home, close to everything! Family friendly room with a view! Property 36: Family friendly room with a view! Property 43: A Real Life Hallmark Movie! Property 46: Experience Downtown Hartford from the top ! Great property for our Six Flags visit. Well stocked and comfortable. Plan to stay here again. Owner was responsive and very professional!! !